The variable GETTEXT_PACKAGE is set to "libgweather-3.0" when building libgweather, which makes the libgweather-common binary look for translations in files named "libgweather-3.0.mo". The template name in Rosetta (LP) is "libgweather", so the files provided by the language packs are named "libgweather.mo". This mismatch results in the messages describing the weather type always be displayed in English. The uploaded package works around the issue by setting GETTEXT_PACKAGE to "libgweather". In bionic the template name in Rosetta has been changed to "libgweather-3.0", and thus the workaround will be reversed. 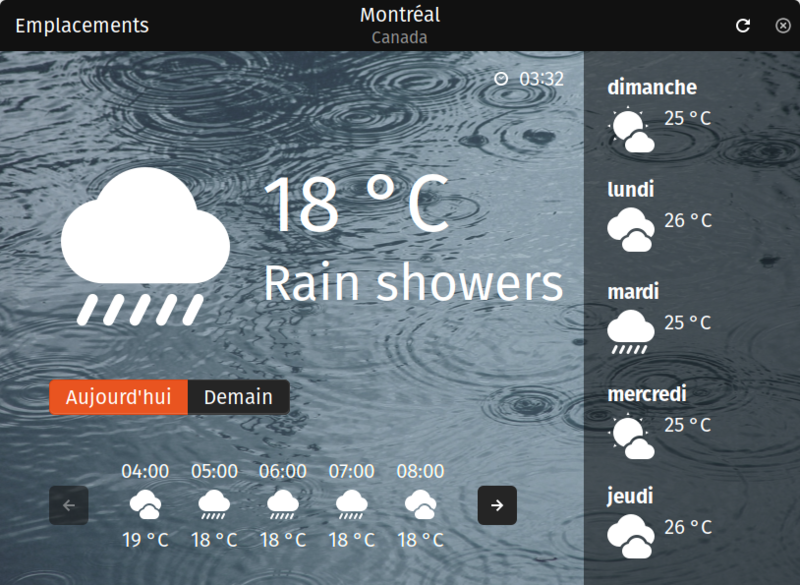 In Gnome Weather, part of it is not translated in french : cloudy, rain showers, etc. Should be : nuageux, pluie fine, etc. I guess it's a missing french localization. Fedora does not have that problem. In Gnome-Software, they have a section for languages, under the extensions section. @Jeremy: AFAICT the strings mentioned in the bug description don't exist in the gnome-weather package. Any idea where they come from? Gunnar, could you check if libgweather provides those strings? So this seems not to be it. I can confirm this on a german install. I believe these strings are in libgweather and not gnome-weather. libgweather actually provides two potfiles, these strings should be in the libgweather potfile instead of the locations one. From the publishing history, libgweather has been in main continuously for years. Is there some way to fix it or a workaround ? Something I could try to help ? 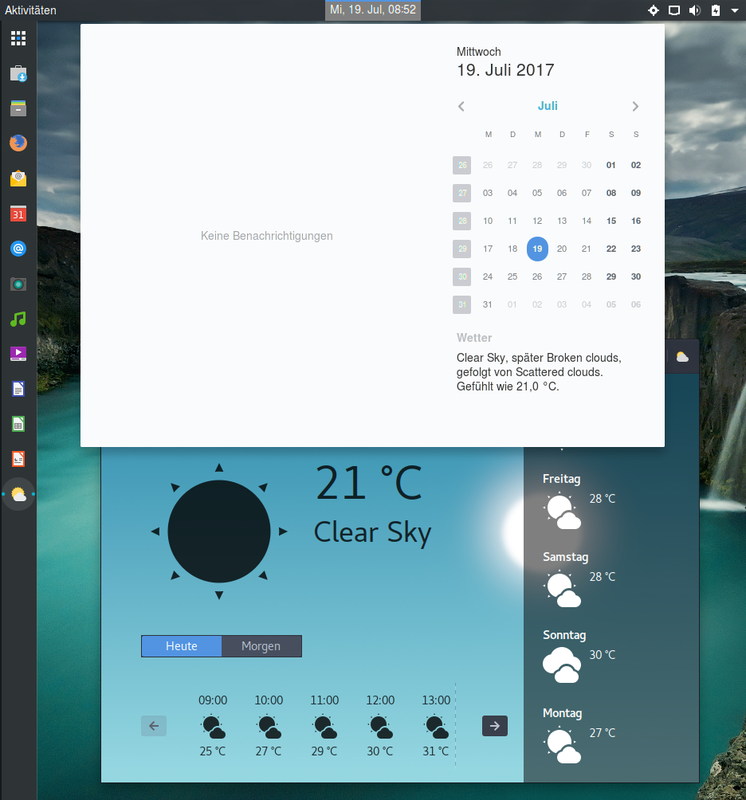 2017-08-18 - Ubuntu Gnome 17.04 - meteo mix franche and english. Exemple : "Broken clouds, puis Drizzle, suivi par Overcast plus tard. Température ressentie : 22,0°C"
In fact the problem is simple : libgweather-common.deb had not package the traductions (!!). See here the complet list of "normals" files : https://packages.debian.org/sid/all/libgweather-common/filelist. In Ubuntu 17.10 and 18.04, libgweather-common.deb has NOT these files. /usr/share/locale is not include. and i copied them (in root) in the same directory on my disk. And GNOME-WEATHER just Work. In french. Christophe, thank for your feedback and helping to make Ubuntu better. Ubuntu does use the same packaging for libgweather as Debian, except that Ubuntu uses language packs. There is a problem with gnome-weather not working correctly with Ubuntu language packs. This might be similar to LP: #1491787 which was just fixed upstream in GNOME. It might be a way to fix it on stable releases. Going forward I suppose we should make the language packs build with the right filenames. Gunnar, I'll upload that to bionic to see if it works there too. (It might work in the PPA just because locales aren't stripped there). and it still found the Swedish translations. So it ought to work also when the translations are stripped. and I still experience the bug. > and I still experience the bug. Those binaries fix the bug for me on bionic. P.S. I also tested the idea to modify gweather-weather.c directly, but that did not work for me. Gunnar, thanks, I can confirm it works now. I guess my problem was that I tried to run LANGUAGE=fr gnome-weather instead of fully changing my locale. Gunnar, do you want to try proposing your suggestion upstream to GNOME? My theory is that the template name in LP should have been changed then from "libgweather" to "libgweather-3.0", but that did not happen. And that may be the reason why the langpack builder keeps creating files named "libgweather.mo". So the change may be an SRU candidate if it's considered important enough, but my belief is that the 'right' fix in 18.04+ is to change the langpacks somehow and drop the patch. And if nobody has time to do that, keeping the "hack" as an Ubuntu/Debian delta for now is another option. I think I have permission to do that, but want to talk with Sebastien first. Discussed the proposal in comment #21 with Sebastien Bacher, and changed the template name and translation domain to "libgweather-3.0" in LP for bionic. For the record I'd like to mention that the key information to spot the root cause of this bug was provided in Christophe's comment #10, even if the solutions differ. Thanks, Christophe, for your helpful contribution! Uploaded debdiffs to the SRU queue where they will need to be manually approved by the SRU Team before being built as proposed updates. Accepted libgweather into xenial-proposed. The package will build now and be available at https://launchpad.net/ubuntu/+source/libgweather/3.18.2-0ubuntu0.2 in a few hours, and then in the -proposed repository. Accepted libgweather into zesty-proposed. The package will build now and be available at https://launchpad.net/ubuntu/+source/libgweather/3.24.1-0ubuntu0.2 in a few hours, and then in the -proposed repository. Accepted libgweather into artful-proposed. The package will build now and be available at https://launchpad.net/ubuntu/+source/libgweather/3.26.0-1ubuntu0.1 in a few hours, and then in the -proposed repository. I get lots of packages to upgrade. I guess I'm doing something wrong... Not used to do that. and then disable -proposed again. @Thanks Gunnar, it worked like you said. Can confirm that the fix works ! Thank *you*, NoOne, both for reporting the issue and for confirming the fix. the untranslated weather conditions in the GNOME Weather app. The verification of the Stable Release Update for libgweather has completed successfully and the package has now been released to -updates. Subsequently, the Ubuntu Stable Release Updates Team is being unsubscribed and will not receive messages about this bug report. In the event that you encounter a regression using the package from -updates please report a new bug using ubuntu-bug and tag the bug report regression-update so we can easily find any regressions. > changed the template name and translation domain to "libgweather-3.0"
> in LP for bionic. With version 1:18.04+20180118 of language-pack-gnome-*-base and version 3.26.1-2 of libgweather-common this has now been fixed the correct way in bionic.